Picture is a good ol’ traditional heavy metal that hails from the Netherlands and they got their start in 1979. They achieved a bit of success in Europe in the ’80s and were able to tour throughout the continent with rock titans like AC/DC, Ted Nugent and Saxon. The band broke up in the late ’80s but reunited in 2007 and result is Old Dogs New Tricks– their eighth studio album and their first album in 22 years! When a copy of this album came across my desk awhile back, they seemed familiar to me but I couldn’t figure out why. I did some research and my usual online music resources had little to no information on them. I just couldn’t figure out how I somehow already knew of the band until I released I had stumbled across their listing on Rate Your Music last year and took a short interest in them. That interest fizzled out when it appeared none of their albums had ever been issued on CD, or if they had, they were out of print. Well, I am happy to say I am now a proud owner of a Picture CD and it’s a mighty fine release. If any of their previous albums are as good as or better than Old Dogs New Tricks, the world has really been missing out. More people should be aware of this band and also of this album! “High On Fire” is another energetic slab of metal and “Live By The Sword” slows the pace down a bit but it actually one of the best numbers on this album. The album opens with “Old Dogs New Tricks” which reminds me of some of Anvil’s mid-tempo numbers. I thought it was an odd choice to open the album due to tempo, but it has gone on me. Next is “Blood Out Of A Stone” and this is really when the album gets on a roll. It’s a fast paced number that pleased me and should please other traditional metal heads. I love the guitars here. “Now It’s Too Late” is up and a fantastic ballad. It may just be my favorite track, I can’t stop listening to it. Probably the heaviest number on the album is “Who Can You Trust”. More fantastic guitars from Jan & Rob and I love the drums as well. “Choosing Your Sign” is another great number. Great riff, just dark and determined sounding. And the rest of the album is nothing to sneeze at! The songs have a modern touch of production but still retain a 1980s classic heavy metal sound and there’s absolutely nothing wrong with that. I just love that so many classic rock/metal bands are coming back and delivering such solid material. Granted, I’m not familiar with Picture’s earlier works but for any band to reunite after so long apart and come up with such an enjoyable album is fantastic and quite a feat. 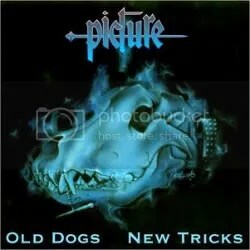 Old Dogs New Tricks is easily one of the better albums from 2009. It’s shame I didn’t hear it then. It may have made my Top 10 list. Okay, I gave a glowing review — can someone now PLEASE get to work on issuing the old Picture albums on CD?? ?